I tried to use my sparkling new Oculus Go on an airplane yesterday, since it seems like the obvious place to use it. The number one thing I think people will want to do with this device is download some Netflix movies for a plane. 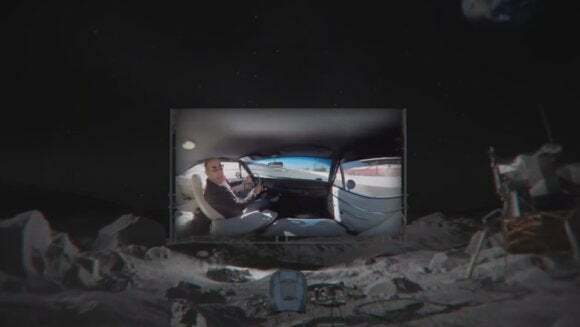 I mean, who wouldn't want to leave the cramped loud environment of an airplane for the calm of their favorite movie over a fun moonscape background. Sadly, Netflix doesn't support downloads in their VR app, even though they do in their mobile ones. Hey Netflix! Turn it on! Since Netflix was out I tried a few games. They felt awkward to use on a plane. I'm always worried about disturbing my neighbors or hitting the wall. I did place some interactive films, though. The Jurassic Park experience works well offline. They even have a button on the splash screen to download the entire footage for offline play instead of streaming. I appreciate being given the choice. I'm also not happy with the Facebook centric features. All sharing options for screenshots and videos depends on Facebook. I can also only stream to Facebook. Given that Twitch is the number one place people want to stream video games, I hope they fix this soon. Connecting to wifi worked quite well. When I was in the airport the Go found the free wifi network and noticed it was in a captive portal. However, it didn't launch the browser. Instead it produced a notification telling me to launch the browser manually. I'm guessing this is just a missing feature the will fill in at the next OS update. The list of apps requires paging. Instead it should be a long list. There's unlimited screen space in VR, let's use it. The controller has a nice trackpad to use with scrolling gestures so it should be easy to fix. None of the other video apps I found supported offline video streaming either. Questions to the Oculus Go Reddit steer me to sketch video copying apps. Not interested. There should be a section for local multi-player apps. I think it would encourage more people to buy Go's is they could jointly play with their friends in the same space. It would also be fun to have one person wear a headset and others manipulate the environment using their phones. I really want some apps targeted at airplane use. Not just offline mode, but single player adventure games with minimal motion, relaxing environments stuff to fall asleep to. Meditation games.